Egypt is heading to the polls in its first parliamentary elections in three years. I call on all Egyptians to go out to the polling stations and stand up again strongly to implement our right. The country has been without a parliament since June 2012 when the democratically-elected main chamber was dissolved. It was dominated by the now-banned Muslim Brotherhood, led by Mohamed Mursi. The vote is the third and final stage of Egypt’s road to democracy: the first being the adoption of a new constitution; and the second the 2014 election of former army chief Abdel Fattah el-Sisi to the presidency. He has urged people to cast their ballot. “I call on all Egyptians to go out to the polling stations and stand up again strongly to implement our right (to vote), which we have agreed on,” he said. “I invite you all, men and women, young and elderly, farmers and workers from all over the country. Please gather for the sake of the country and celebrate by choosing your representatives. And choose them well,” he added. 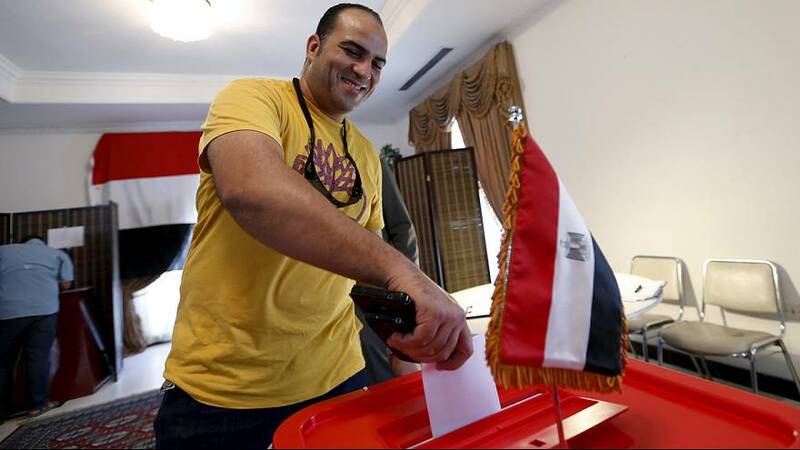 Egyptians living abroad began casting their ballots on October 17, a day earlier than those in Egypt. Afifa Ahmed Mohammed voted from Dubai. A second round of voting will take place in November, 2015, with results expected by December. Polls suggest a coalition of parties loyal to the president will win. The vote was originally due to begin in March, 2015, then postponed when part of the election law was ruled unconstitutional.